I had the hardest time deciding what to name this post. There are so many tasty ingredients in this salad. With all the wonderful flavors blending and contrasting with each other, it was difficult choosing which ingredients to highlight. Though I chose beets, avocados, edamame, and blood oranges for the title, it doesn’t mean that the mint, cilantro, and red onions should be ignored. And who can overlook those colors? Tossing the red onions with the beets and vinaigrette made them turn a beautiful hot pink color! Even the kitchen scraps of beet peels, orange rinds, and beet stalks were gorgeous. This salad was sparked by my husband who came home from the farmer’s market last weekend with two big bunches of beets. Normally, I would have just roasted the beets with some olive oil, salt and pepper. However, since we had so many beets this time, I decided to get more creative especially after seeing how creative one can get with beets at last week’s farm dinner. I’ve been admiring Yotam Ottolenghi’s cookbook, Plenty, at the bookstore for awhile now and really wanted to try one of his recipes. And I wasn’t going to let the small problem of not actually owning his cookbook stop me. Fortunately, Mr. Ottolenghi writes a regular column for a London newspaper and I was able to find his beetroot salad recipe on-line. I made several modifications though. Most notably, I added the blood oranges which I spotted at my grocery store earlier this week. Their color was right in line with the rest of the ingredients and they added just the right amount of sweetness to the salad. You can replace the blood oranges with navel oranges but the flavor won’t be quite as intense. Like most salads, I consider the amounts listed in the recipe to be more guideline than gospel. You should adjust them to your own preferences. If this salad doesn’t keep the winter doldrums at bay, nothing will. Peel the beets and slice them very thinly, around 1/8-inch thick (see Notes). If the beets are large, cut them in half before slicing them. Bring a pot of water to a boil. Add the edamame and cook very briefly just until they are barely heated through. Remove the edamame from the water with a slotted spoon and put in a small bowl. Set aside. Return water to a boil then carefully add the sliced beets and cook until the beets are semi-cooked but still crunchy, about 3 minutes. Drain the beets and put them in a large bowl. Set aside and let cool slightly. In a small bowl, whisk together red wine vinegar, apple cider vinegar, olive oil, sugar, salt and pepper. Pour vinaigrette over the beets and add the red onions. Gently toss everything together using your hands. Let sit for 10-15 minutes. While the beets and onions sit, prep the oranges. Using a sharp knife, cut a thick slice off the tops and bottoms of the blood oranges to expose the flesh. Working with 1 orange at a time, place it upright on a cutting board and cut off the peel and white pith in wide strips. Cut the oranges crosswise into 1/4 inch thick slices. When ready to serve, spread the beet mixture on a large platter. Layer the avocados on top of the sliced beets. Sprinkle on the cilantro and mint leaves and the edamame. Then top with the orange slices. Drizzle with a little olive oil and serve. For slicing the beets, use a mandolin if you have one. It’s the fastest and easiest way to get thin, consistent slices. Recipe adapted from Yotam Ottolenghi. I giggled when I read your opening line because I have that problem often too!! I know exactly what you mean. 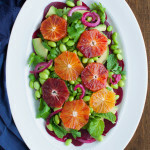 But you know, for something like this, I think using the ingredients in the name is clever because it means when I have edamame and blood oranges, when I do a search it will pick up this recipe 🙂 As opposed to, for example, “rainbow salad” or something like that. 🙂 It’s a combo I never thought of but I already know it works!! Love. 🙂 Sharing! Thanks, Nagi. Your advice is always spot on!! I’ve just recently discovered how tasty blood oranges are. Can’t wait to try new recipes using them.